Victim in hit and run crash was involved in incident 50 years ago. 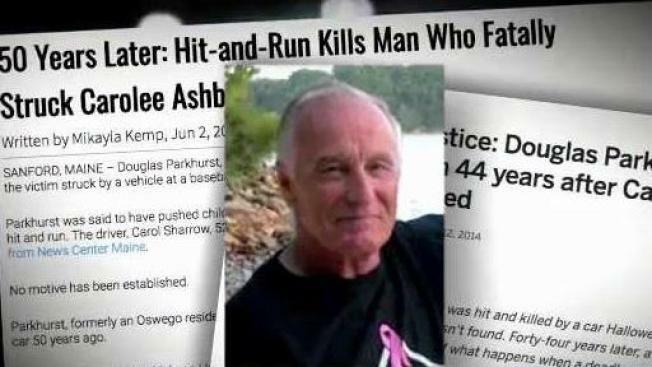 A Maine man credited with saving the lives of kids before he was killed by a hit-and-run driver at a Babe Ruth baseball game was himself involved in a fatal hit and run in New York nearly 50 years ago, according to a report. The Portland Press Herald reports that Douglas Parkhurst, a Vietnam veteran, confessed in 2013 to a hit and run in 1968 that killed a 4-year-old girl in Fulton, NY. Despite his confession, Parkhurst was never faced charged in the case since the statute of limitations had expired, according to the paper. Parkhurst died in Sanford on Friday night when 51-year-old Carol Sharrow drove onto the Goodall Park ballfield during a baseball game, according to police. Parkhurst reportedly helped kids move out of the car's path but was struck and killed himself while trying to close a gate and prevent the car from fleeing. Sharrow allegedly fled the scene in her car and was later arrested. She has been charged with manslaughter. The Portland Press Herald, located in Portland, Maine, reports there was no connection between Sharrow and Parkhurst prior to the incident. In 2013, Parkhurst confessed to being the driver in an unrelated hit-and-run incident that led to the death of Carolee Ashby on Halloween night 1968. Ashby was walking along a road in Fulton, NY, with her older sister when she was struck by a car and thrown 133 feet, according to the newspaper. Parkhurst sped away, according to the news report. According to The Post Standard in Syracuse, NY, police questioned Parkhurst twice about the incident. Parkhurst, who was then living in Oswego, NY, went to the Fulton police station and admitted in a four-page confession to driving the car in 1968, the Portland Press Herald reports. “I know in my heart and I am 99.9 percent sure I hit that little girl with my 1962 tan Buick Special. I am oh so sorry. I can’t change anything but I hope this apology will be accepted and I beg for forgiveness,” the paper quotes from the confession. In an interview Saturday with one of the Fulton police officers who investigated the case, he commented on the irony of Parkhurst's death in Maine. “God works in mysterious ways,” Johnson said in a telephone interview with the paper. On Friday night, witnesses credited Parkhurst with saving others during the Maine incident. "I saw the car pull out of the gate," witness Justin Clifton, who was playing basketball at the time, told News Center Maine. Clifton said that the man pushed some children out of the way. "He took the hit for the kids," he said.